This week we received confirmation that we (BARA/California Amateur Radio Operators) are registered in opposition to AB-1222 in its present form. This is supposed to give us recognition and a brief time to address the CA Senta Transportation and Housing Committee at their meeting July 11, 1:30 PM. Given the significant list of those in support vs our lone opposition, this is a pretty daunting moment for two-way and amateur radio. Norm and I knew we could face this dilemma, and our last words before his untimely passing were to "stay the course." There is no question but to stand up to the effort I started, honor Norm's efforts and those of everyone else who have supported us. At the very least we got some traction/progress in mildly improving CVC 23123.5 into AB-1222. It's been our belief all along that in such a simple, obvious matter, it *could* be better - this is California - it's what we've been told and that's what we expect - yes? Addressing this all along, and especially now is a monumental challenge of patience and doing the right thing. I am very pleased and proud and appreciative for all of the support and assistance! This is NOT a specific call to action, but if your local Senator is a member of the Senate Transportation committee, it wouldn't hurt to give their office a call and share some support for us and this process. In closing today, I ask you reserve a moment of silence for our dear friend Norm Lucas, WB6RVR (sk). This effort I dedicate to Norm and his years of leadership and friendship as we served the NARCC Board together, and now this. Thank you Norm and everyone! May 29, 2017: Last week, 2PM, 24 May, I had a brief meeting with and delivered the following documents to State Senator Jim Beall's staff. The intent to establish a clear working position from the foundation of a couple of Federal grant programs and their provisions - leveraging equipment and service types already defined in law. Hopefully the result is that we are 'registered' as "in opposition pending amendment" to clarify what is being regulated (and not-stated) what is not being regulated. Clearly there are Federal programs with specific limitations on what is allowed as an exemption/exception. By default and legal definition (US Code) no "private mobile service" (which includes CB, commercial, public safety and amateur radio) is "regulated against" in the context of distracted driving. The goal is to get the "commercial mobile service" and devices (interconnected/cell) specifically referenced in the law(s) as intended. THIS IS SIGNIFICANT for any/all States dealing with this issue. By being 'registered' in opposition this is at least one way to be heard. The other is to ensure MORE PEOPLE are so-registered and refer to the documents linked below. This opposition MUST be made known to the Senate Transportation Committee and your local Senate representative. ACT NOW!!!! Sadly AB1222 has moved out of the Assembly and is going to the SENATE Transportation committee soon. We need for the SENATE to defer AB1222 back to the Assembly Transportation committee for proper revision! AGAIN it is imperative we take immediate deliberate	steps to be heard by all of our representatives! A more formal version of the copy-and-paste text below has been e-mailed to the entire Senate. Your part is to register opposition with your Senator as soon as possible = NOW! If this bill passes the Senate Transportation, it will go to the Senate for vote and likely be the 'new' law. It is again and always time to act! Share this with your ham clubs, repeater groups, ARRL, SAR, Red Cross, CA-related Facebook and Yahoo groups, etc. Call their Sacramento office and register your opposition and desire per the script in green below. Calls are logged and tagged as to the issue they are about! "Hello, my name is _________ from (city). I am calling to register opposition to Assembly Bill 1222, as it is presently worded. I ask instead that AB1222 completely codify the Author's own Legislative Analysis *and* the recent CHP enforcement memo. Instead, I fully support the amendment language of AB1222, as recently offered by the Amateur Radio Operators of California – Change.org group." It is important that everyone understand the points of the script - if the specific intent and exemption are NOT in the Bill, they will NOT be in the Law, and just a few edited words do NOT effect the intent of either analysis. Don't get put-off by any rhetoric - they have to comprehend the effective specifics. An alternative but NOT preferred as reading these is delayed - Select the Contact link to fill out and submit a web-form. You MUST use a zip code within the specific Senate district. Paste the specific black text-only as-formatted below and submit. * AB1785 (2016) became law 1 Jan 2017 as CVC 23123.5. * Since its effective date CVC 23123.5 has been perceived as ambiguous, received several law enforcement interpretations that are contrary to the Author’s ‘intent’. *** May preclude Federal - and State-mandated radio communications with risk to transport of hazardous materials and the public. *** At Quirk’s request CHP issued clarification (http://www.no1pc.org/handsfree/CHP-Enforcement-of-Section-23123.pdf) which is not codified in the revised Bill. * Legislative Analysis is not codified in the revised Bill. * With all due respect, in order to avoid problems over future mis-interpretation, the ambiguity of AB 1222 must be fixed to codify the Legislature’s own analysis and CHP’s. * The current version of AB1222 simply must be reconsidered, referred back to ‘Committee’, or revised in session to reflect both the intent of the Author and the exemption information provided by California’s leading law enforcement agency (CHP). (g) "For the purposes of this section, “electronic wireless communications device” does not include any two-way radio that is operated under a currently active license in any NTIA or FCC regulated service including but not limited to public safety, educational, land mobile, aviation / aeronautical, broadcast, railroad, business, marine, CB, GMRS, FRS, MURS and amateur radio. This section also does not include any device that is operated under a current NTIA or FCC issued Special Temporary Authorization (STA). At the very least use the language of the CHP enforcement interpretation. We ask all California legislators to help resolve the issue with this Bill and further amend AB1222. Stay alert for more information and check the links below to follow the Bill through processes. On 26 September 2016 the State of California under Assembly Bill 1785 approved a new level of hands-free driving law, effective 1 January 2017. From that time on various law enforcement entities issued their interpretations into what we'll call "enforcement memos", that varied by jurisdiction and seemed to contradict the cell-phone-only intent of the law. This was deemed inconsistent and unsustainable - different application of a law at the discretion of local agencies - NOT a good thing. On 2 February 2017 I initiated a CHANGE.ORG petition calling for 'correction' of the ambiguities. In the weeks following the initiative received a lot of 'feedback' and gained the direct assistance of Norm WB6RVR, Glen K6KJQ, recently Mike WA6ILQ and pursued law enforcement, legal and ARRL contributions to the concern. We have had direct and indirect contact with the law's author, Assemblymember Bill Quirk, his Chief of Staff, their law enforcement advisor from the California Police Chiefs Association and others. 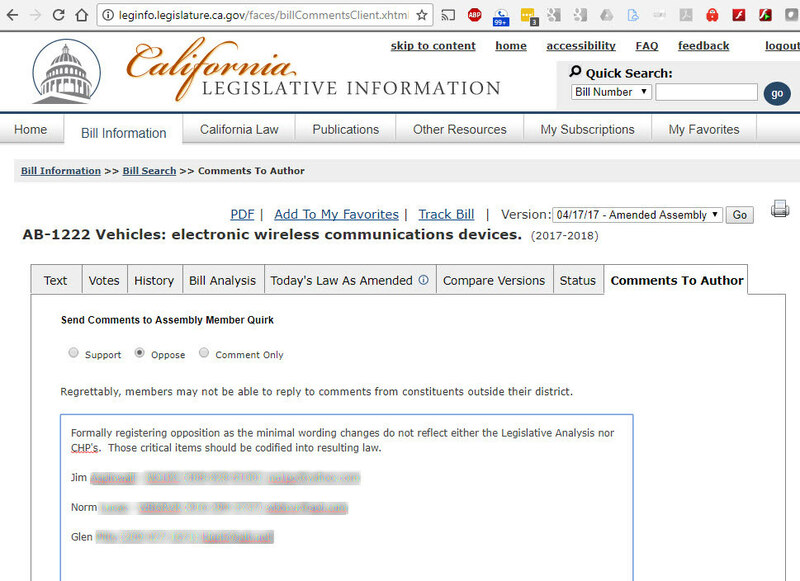 Assemblymember Quirk and staff are emphatic that this was only to apply to cellphones, and is to have submitted an article to the Legislative journal stating such. CHP has issued an "enforcement memo" stating that CVC 23123.5 does NOT apply to radio use. That may work for CHP but uncertain agencies will get or heed said memo. Unknown if it would ever be possible to get the "top cop"/Attorney General to clarify the law for the courts. We have considered aspects of "legal findings" as to whether or not something that does not have ANY legal case or precedent can be prohibited. 'Average' people have been operating mobile radios in various services legally, and without known issue for over 70 years, vs. the past 10 years or so of known risks of cellphone use, texting, etc. We have also learned of other states with similar issues, specific exemptions and significantly the NTSB and NHTSA initiatives and grant money offerings to decrease distracted driving. We have learned of many state and Federal laws that in some cases REQUIRE two-way radio as a matter of safety compliance, that State laws may conflict with. We have experienced little interest then total lack of communications or support from ham radio's ARRL - and sadly now know why they could and would not 'engage' - and sadly for us and them it was their own approach and the reception they got that seems to have scared them off. Most in the ARRL that will say anything admit we've got 'more' on this than they. Kind of sad their legislative liasons missed out. 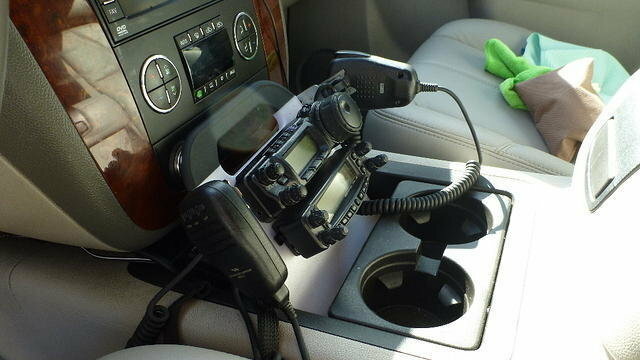 "Ham radio" is NOT any more or less entitled or 'special' than any other radio service - government or private. "Regulating technology" is not an obvious or easy task, given consumer concerns, behaviors, types of technology use and interactions, etc. They are not all the same and trying to distinguish them for the public, lawmakers, etc. is a challenge not to be under-estimated. One must be aware of the audience and address them appropriately. What follows are links and documents pertinent to our requests, suggestions, 'education', and proposals to keep such laws reasonable and prudent, not just for Amateur Radio but all of the many legitimate, non-risk recreational, occupational, public service, and public safety services employed throughout the United States. The "take away" for any and all is to BE VIGILANT in watching for ANY and ALL laws that might have or eventually have unintended consequences where not needed. We believe, through reasonable, rational, respectful consideration and dialog, we have been and will continue to be successful through the course of this effort. Use this document as a basis for outreach to your local Assembly and Senate representatives. This is the current law effective 1 Jan 2017. This is the current legislation in process to monitor and comment on as appropriate! CA Assembly analysis, and hearing date 24 April 17 posted! These are our collected comments, concerns, proposed re-wording toward an well-considered, comprehensive improved law. These will be provided in-person to go on record. We were asked about the training radio operators get. This is our response. CHP Enforcement Memo = "does not pertain to radios"
Not a SINGLE mention of two-way radio use. No history. No experience. No causal indicators. No findings. This is one of two heavily driving forces/initiatives that could take the mikes out of our hands. This is the other of two heavily driving forces/initiatives that could take the mikes out of our hands. This is where some of the money is in this. Is there more? This is another of the driving forces/initiatives that could take the mikes out of our hands. We welcome additions and updates to this list to help everyone get and stay informed. It is up to the citizens, taxpayers, voters in each city, county and state to get informed and track legislation as it it matters - IT DOES!! Initial Summary of Other States with "Radio Exemption"
Laws should be quite specific as to what is and is not allowed or prohibited. Wording, legal definition, technical specifics, scientific fact, prior legal precedent/findings should rule if at all, NOT feel-good agenda, 'initiatives' or grant monies, etc. Voters should be on the lookout for these words/phrases, context, nuances, that leave laws subject to broad and mis-interpretation, unintended consequences, and more complicated legal issues than necessary. include/exclude "but not limited to..."
Vague, non-specific definitions of equipment, devices, actions, etc. are ripe for over- and under-interpretation, implementation and complex legal/court cases. Technology *is* hard for some. It didn't just appear 'yesterday', and just because a person, legislator, staff, governor, lawyer or judge is not intimately familiar is NO excuse to allow a lot of well-intention words make it to law and affect lives, good or bad. In reality 'electronic', 'wireless', 'radio' covers thousands of items, INCLUDING those that may be used or recommended as the solution for the issue being addressed - for example, Bluetooth headsets. In many cases 'handheld' may be secured and become mounted, affixed, attached, in such as way as to not be operated while in-hand. Beware which Federal, State and Local laws may or may not be over-ridden, superceded or otherwise conflict with new laws. Federal DOT laws regarding over-sized, special or hazardous material transport, etc. "Posted speed: 65. Vehicle speed: 65. Determined safe speed: 0." Result = 65 MPH over speed limit !!!! We all need to be aware of who else is saying what on-behalf of or in conflict with initiatives and agendas surrounding issues of importance. The ARRL, several Federal agencies, several advocacy groups, etc. have significant stake in many aspects of what we do in technology and life. Be aware! No specific content yet for this section. We want to start listing the signficant served agencies, attornies general, Federal judges, case law example/precedent, and NGOs who have specifically come out in FAVOR and NOT in FAVOR of maintaining the legality of two-way radio use while operating a motor vehicle. This will not be a list of "xyz in our county uses us for..." - it must be a list of known entities that have or will issue and testify with supportive statements of justification and critical need - be it life-threatening conditions or not.